• Montpelier, Vermont is the only U.S. state capital without a McDonalds. • Until 1996, Vermont was the only state without a Wal-Mart. • Ben & Jerry's Ice Cream company gives their ice cream waste to the local Vermont farmers who use it to feed their hogs. The hogs seem to like all of the flavors except Mint Oreo. • The state of Vermont has more covered bridges per square mile than any other state in the country. 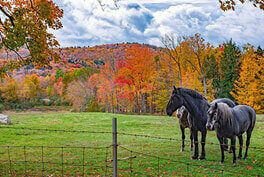 • Vermont's the largest producer of maple syrup in the U.S., producing over 500,000 gallons a year. • Consider this the next time you eat pancakes: It takes about 40 years for a sugar maple to grow large enough—at least 10 inches in diameter—to tap. Then it takes some 40 gallons of sap to produce a single gallon of syrup. Don't waste a drop! • VT is the second-largest state in New England, with Maine the first. • VT is 160 miles long and 80 miles wide. • 77% of Vermont Is Covered with Trees. • Billboards are outlawed in Vermont. • In case you’re wondering, it is illegal to whistle underwater in Vermont. • If you’re happy and you know it, you must live in Vermont. The state consistently ranks in the top states for health, happiness and intelligence. • Vermont is one of only two states in America to offer snowboarding as a varsity sport that comes with a state championship. • IBM is Vermont’s largest employer. • It's illegal to undress in public in Vermont, but if you leave your house naked, it's totally fine. • In the city of Barre, all residents are required to bathe every Saturday night. • And lastly, if you're a woman and you want to get false teeth, you're going to have to ask your husband for a written letter of permission.